Arturo Fuente premium cigars, being amongst one of the most demanded, desired and fashionable cigars have been producing hand rolled cigars out of finest tobacco imported from the Dominican Republic. This tobacco nearly completely emulates the quality Cuban cigars have demonstrated prior to the embargo the United States created on Cuban merchandise in the 1960’s. Grown on the home plantation of the company president in Chateau de la Fuente, Arturo Fuente’s tobacco is to this day the finest in quality. Arturo Fuente hand rolled cigars are very fairly priced comparing to other hand rolled premium cigars providing a great value along with their exceptional smoking experience. 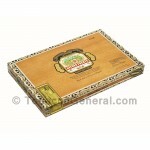 Tobacco General is offering a high quality, low priced selection of these ornate Arturo Fuente hand rolled premium cigars. Try them now!